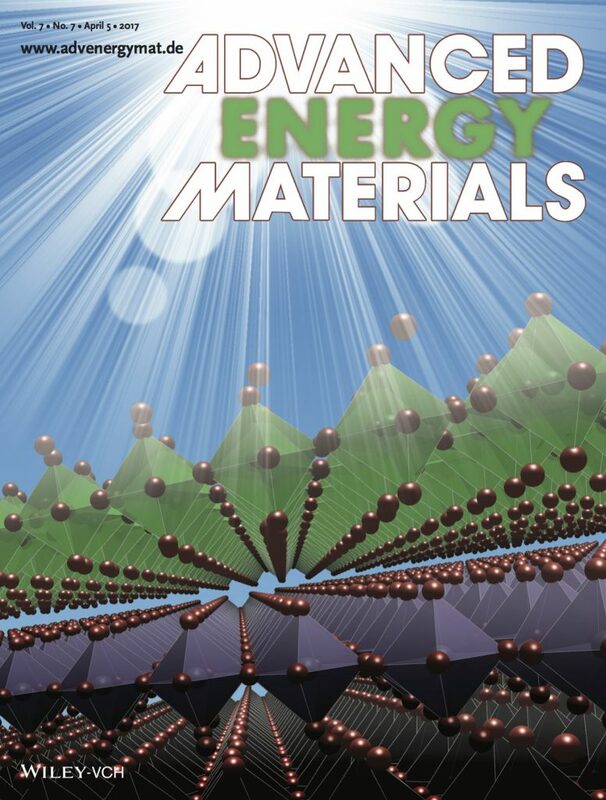 On the Cover: The cover illustration shows the molecular structure of a new material that holds potential for the generation of solar energy. The material is an organic-inorganic hybrid perovskite based on calculations that Xiao Cheng Zeng’s team performed at the Nebraska’s Holland Computing Center. To make the material more environmentally friendly while maintaining its energy-conversion efficiency, the team substituted tin and germanium for lead. The work grew out of collaboration with Jinsong Huang, the Susan Rosowski Professor of Mechanical and Materials Engineering, with support from Nebraska’s Materials Research Science and Engineering Center and the National Science Foundation. Liang Ma, Jun Dai and Xiao Cheng Zeng. April 2017. Solar cells: Two-dimensional single-layer organic-inorganic hybrid perovskite semiconductors. Advanced Energy Materials 7(7). Liang Ma and Jun Dai are postdoctoral research associates in the Department of Chemistry. Xiao Cheng Zeng is Chancellor’s University and Willa Cather Professor of Chemistry.